Edawakare (Yutaka Takenouchi) is the driver of Sen Taxi. His taxi is able to take passengers back to the past to a time they request. DailyDrama Dec 20 2014 7:07 pm I have heard a lot of good things about this drama. ace Dec 08 2014 6:38 pm I have come to terms with my affection for time travel on film. It opens up so many possibilities. And of course, who doesn't have something happen to them and wished they could do it over. I know I do. Almost daily. This is pretty low key show. Not that it doesn't have humor and sadness. I just mean it is not a heavy melodrama. The casting and the script give it a real charm. 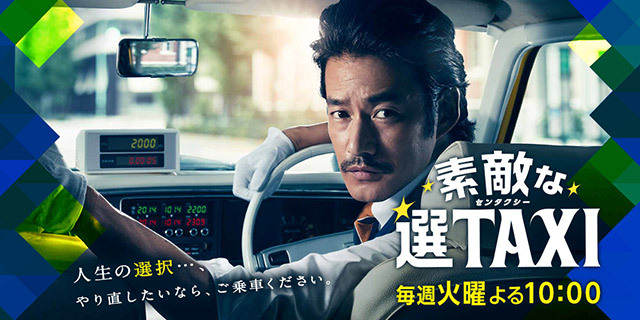 Yutaka Takenouchi is great casting as the time tripping cabbie. With his mellifluous voice, he is perfect for the droll sense of humor that his character possesses. But the rest of the cast and guests are good too. Takeshi Masu, who seems to be in almost everything sooner or later, is solid. And new to me is Nao Minamisawa, as the waitress in the cafe that the cabbie frequents. The scripts are rather clever and fun with the time travel. The humor is not manic but dry.